The API allows for extremely fast development of integrations between applications and content repositories. Analysts, like Gartner, have now identified the integration trend and introduced a new product segment, named content integration services. Xillio, specialist of content migration and integration, announces the launch of its cloud-based API for content integration services. With this API, developers can quickly and easily access a multitude of content repositories and applications or build functionality that provides users efficient access to the right content. This enables users to create or adjust content without having to switch between different applications. 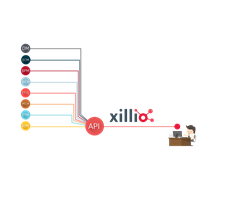 Xillio targets this API at developers at software vendors, system integrators and end-user organizations. The Xillio API is simple and intuitive to use, supports most known content repositories and saves developers a significant amount of time. Without this uniform API, developers must learn various APIs of multiple content repositories to build integrations. Xillio provides one unified content model to which all content meta-data of the integrated content systems are mapped. The uniform API and uniform content model makes integration extremely fast and straightforward. Xillio simplifies the exchange of content and allows organizations to use additional content services to enrich content with additional meta information. Organizations struggle with the large amount of content that is produced and processed on a daily basis. Users spend a large portion of their time on searching, processing and creating content, which is created and stored in different types of systems, such as ECM, DAM, WCM, archive, CRM, PIM, EFSS, file share and many more. The attempts from organizations to migrate content to one central system often turn out to be unfeasible and very expensive. Organization leaders are, therefore, looking for content integration and real-time retrieval of data from multiple sources. Xillio addresses this integration need. Jeroen Huinink, CTO at Xillio, said: "We are very proud that we already have a first customer using the Xillio cloud API. SDL, a provider of translation services and technology, uses our API to enable direct content exchange between the CMS and their translation system. In addition, we see a lot more use cases for which content integration is relevant. For example, think of a customer portal in which the user can see and edit all customer information stored on different systems at a glance. Or an integration between cloud storage applications and an on-premise ECM system, allowing users to access content stored on a legacy content repository through their frequently used cloud storage app. " The Xillio engine supports the most widely known content repositories with its connectors. Currently there are connectors to SharePoint, Office365, Adobe Experience Manager, Alfresco, FileNet, GitHub, Zendesk, Drupal, Hadoop, Elastic, Hippo, Wordpress, Documentum, Box, Confluence, Umbraco, Liferay, Dropbox, Egnyte and File Shares. This list is continuously expending with new connectors. You can learn more about the Xillio API at https://www.xillio.com/content-integration or by taking a look at this animation https://www.youtube.com/watch?v=M21pjUEi-_g.